Writing and thinking about crochet, knitting, and pattern design. This is what happens when academics do crafts. 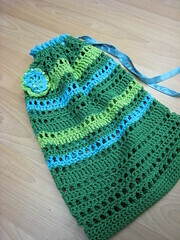 Check out the pattern and photos for the string bag I’m teaching in my beginner crochet class.. This entry was posted on May 14, 2007 at 2:52 pm	and is filed under patterns. You can follow any responses to this entry through the RSS 2.0 feed. You can leave a response, or trackback from your own site. I was in Yarn Forward last week to quickly check prices on sewing machines there. The owner was serving me and we somehow touched on the subject of needle crafts. I mentioned I new the new crochet teacher and she and another lady nearby both chimed up to say how wonderful you are. Thought you’d like to know that. I love the bag I crocheted from this pattern and I’ve posted a photo of it on my own blog: http://www.slowknitter.ca. I’m glad you enjoyed the pattern, Alette. I have been thinking about the environmental issues with this cotton too — especially now I know what’s involved in mercerizing cotton. It’s difficult to find out what processes actually go into making most commercial yarns. What do you think of the new bamboo and soy yarns? I think Madil’s Eden bamboo-fibre yarns would work also well with this pattern, but I’m not sure how they actually compare to cotton after processing. There’s so many different yarns being toted as environmentally-friendly these days it’s hard not to be a bit suspicious of greenwashing. And yes, hard to find out about processing of these fibres. Hemp and bamboo do not require pesticides or chemical fertilizers, putting them ahead of commercial cotton in these respects, but I too have been unable to find out how these fibres are processed. There is certainly no reason to believe that they are dyed with friendlier dyes, unless the companies specifically say so. Adria Vassil in her book the Ecoholic reports that harsh chemicals may still be employed in the processing of hemp fibre especially in China. I would assume that the same would be the case for bamboo. There’s also Tencel, made from trees (so still contributes deforestation), which Adria Vasil reports is processed with non-toxic dissolving agents, whatever that means. Soy and corn are both being used in yarns as well. However, large portions of both crops are being grown as GMOs, especially in the U.S., so that’s a problem. However, the knitter’s review reports that SWTC Soysilk is made out of a byproduct of tofu production. So they have to be given brownie points for making yarn out of a waste product. The Fake Sheep blog has a really comprehensive list of alternative yarns with some discussion of environmental issues. The Summer 2007 issue of Vogue Knitting’s Knit.1 is a green issue and profiles a number of soy, organic, recycled, corn etc. yarns though there isn’t much depth to their reviews. So, the long and the short of it is that I too am struggling to figure out how to crochet/knit with minimal ecological impact.